While Freud tried to pare down the discussion with his infamous "sometimes, a cigar is just a cigar," we all know that life sometimes dictates that a stone might not just be a stone, and that your girlfriend might not just be your girlfriend. And sadly, even one of men’s best buddies of all time can’t simply be just what it is. [firstpara] We’re not talking about your dog here, buddy. We’re talking beer, good ol' beer. A beer, you see, is never just a beer. What it says about you: Congratulations, you’re a dad. Back in the 70s and 80s, beer was marketed heavily towards the ‘tatay’ crowd, and their frequent drinking sessions with their kumpares. San Miguel’s flagship Pale was the star of that time and age, and so the brand has carried that label through the years. 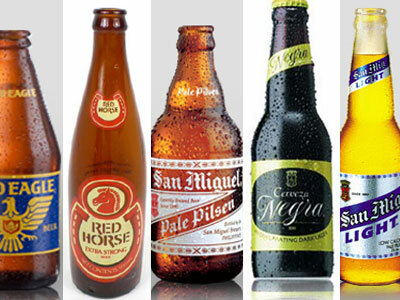 Check out our list of classic San Miguel Beer commercials, and tell us we’re lying. Recently, we’ve noticed that the Pale Pilsen is slowly (as in turtle-slow) losing that ‘dad’ image, crossing over to a maturing yuppy market who think that San Mig Light is too juvenile. Likewise, Pale Pilsen is also becoming cooler to the young and happening, non-conformist hipster crowd who don’t want to drink San Mig Light just because it’s too popular with the rest of the young and happening crowd. What it says about you: You’re young (so young, this might be your first taste of beer), you’re cool, you feel like Dingdong Dantes with this beer in hand, and you can’t afford to exchange those bulging abs of yours for a bulging beer belly. And indeed, San Mig Light only has 105 calories, 25 less than Pale Pilsen. Be careful though, because while calorie-wise it’s lighter than most beers, it actually has the same content of alcohol as Pale Pilsen (5% by volume). So really, it has the same liver-damaging potential as Pale when it comes to mahaba-habang inumans, while being paler in overall flavor. Also, even if it’s a light beer, you’ll still have that beer belly, if you plan on drinking around 7 bottles every other day. Neil Gaiman is in town!